These pewter beads and charms are like nothing else you’ve seen. We use a special blend of lead free pewter with a dash of precious metal silver to make high quality, shiny alphabet blocks, message beads and pewter charms, made here in the USA. These aren’t plated, so the finish doesn’t scratch off like other pewter products. Get the shine and a superb quality product even when you don’t want the expense of .925 sterling silver. Lead free. Now you can get the look of the more expensive European style bracelets like Pandora, Chamilia, Biagi, Troll and more with our new silver tone Luv Link beads, Murano glass beads and bracelets. 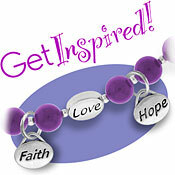 Put together your own bracelet today at a fraction of the cost!